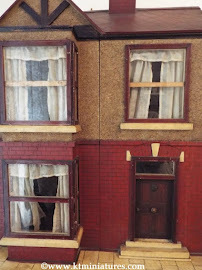 I am devastated to announce that due to the bereavement of "Mr KT", KT Miniatures is closed temporarily for business until further notice. Sadly Dave's long eight year battle with chronic illness came to an abrupt end yesterday during the much wished for transplant operation...it just wasn't meant to be for him. His wonderful humour, cheerfulness and bravery has been utterly inspirational throughout and he will be greatly missed. Any outstanding emails or enquiries will be dealt with as soon as circumstances deem it possible once again. 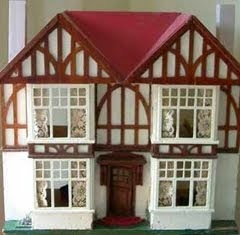 KT MINIATURES IS CLOSED FOR A FEW DAYS UNTIL FURTHER NOTICE! 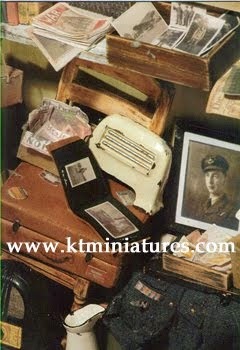 UNFORTUNATELY IT HAS BEEN NECESSARY TO CLOSE KT MINIATURES FOR A FEW DAYS, IN FACT UNTIL FURTHER NOTICE. I HOPE TO OPEN ONCE AGAIN AS SOON AS POSSIBLE. THANK YOU FOR YOUR PATIENCE. Workshops Over (For Now) - End Of An Era! 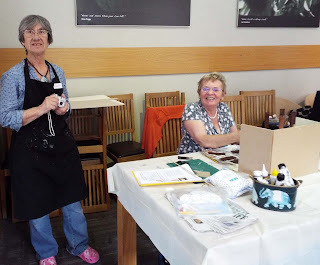 Last Saturday we held our very last Nostalgia In Miniature Workshop project at our Bicester Avenue Garden Centre venue with a truly super group of ladies. It was a lovely day but at the same time tinged with sadness, as it was the last time I will ever have the pleasure of working with my workshop colleague - Robin Britton, who also happens to be a great old mate too. I just about managed to snap this photo of Robin, she hates having her photo taken and has always gone to great lengths to try and dodge the camera! But on this occasion she thought I was taking a photo of Geraldine (she is the lady seated and a long standing stalwart of our workshops) who was busy working on her little shop. Ha ha, little did Robin know that I had sneaked her into the left of the shot! This was our last workshop project which everyone had great fun tackling last Saturday, and I think it was fair to say that it was probably the most versatile workshop project that we had ever embarked on, as the makers had a huge choice on colour, configuration of shelves, doors, components, etc. They could truly make it their own to suit. CLICK HERE to view more photos of the day to see what everyone got up to. 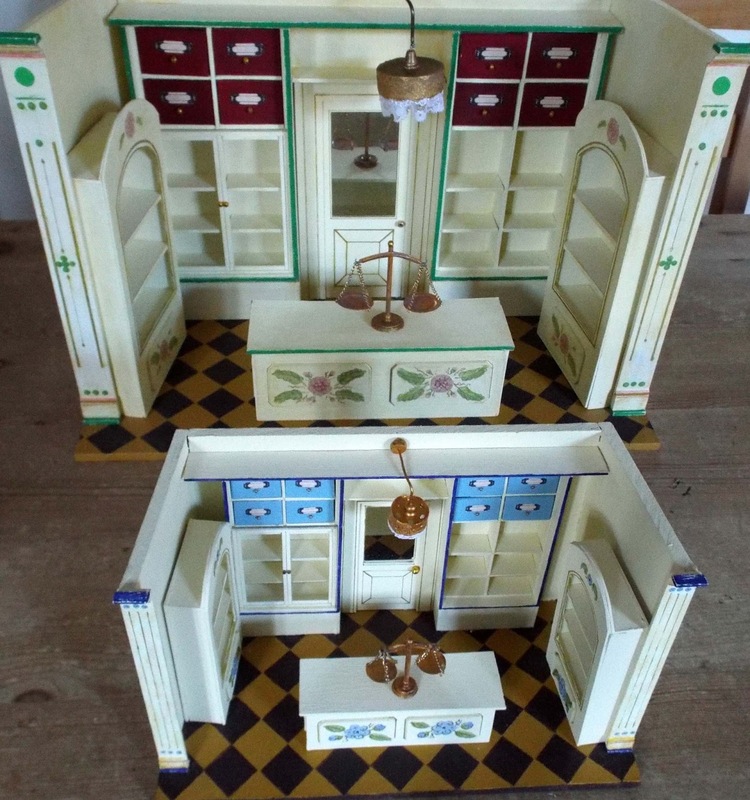 But now Robin has officially retired from the professional world of miniatures and I am sure that anyone who knows Robin, would not hesitate to join me in wishing her well in her retirement. She and her Coombe Crafts will be greatly missed by a lot of people. 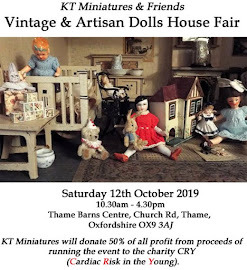 I am hoping to continue with workshops once Mr KT has embarked on a journey of recovery healthwise and then they will come under the banner of KT Miniatures. 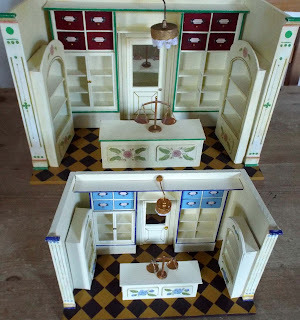 Meanwhile the tiny doors have finally closed on Nostalgia In Miniature Workshops, the workshop website will stay live until the end of July and then after that date, all traffic will be redirected to KT Miniatures website. Thank you to everyone who came to any of our workshops over the years...what a wonderful adventure it has been!